The most common way of using the BPFT is for testers to adopt the parameters recommended for use with youngsters who have specific disabilities. Health-related needs and concerns of youngsters with intellectual disability and mild limitations in physical fitness include those of youngsters in the general population. This test item and its procedures were modified from Johnson and Lavay (1989). In it, participants perform as many bench presses as possible (to a maximum of 50 for males and 30 for females). The test is designed as a measure of upper-extremity (particularly elbow-extension) strength and endurance. This text offers adapted physical education teachers the most complete and up-to-date health-related fitness testing program available for youngsters with physical and mental disabilities. It is compatible with and can be used alongside Fitnessgram and includes an online resource that demonstrates assessment protocol for the tests. The Brockport Physical Fitness Test revolutionized fitness testing for youngsters with disabilities when it first came out in 1999. This significantly updated edition takes up where the original left off, offering adapted physical education teachers the most complete health-related fitness testing program available for youngsters with physical and mental disabilities. The text also supplies a glossary and many appendixes, including a body mass index chart, guidelines on purchasing and constructing unique testing supplies, conversion charts for body composition and PACER, data forms, and frequently asked questions. Brockport Physical Fitness Test Manual: A Health-Related Assessment for Youngsters With Disabilities is compatible with Fitnessgram 10. The text’s updates include standards and language that help teachers use Brockport and Fitnessgram side by side in providing youngsters and parents or guardians with the best possible individualized education programs (IEPs). Rely on research-based assessments and standards for people with disabilities. Provide youngsters with disabilities the same opportunities as other students to have their health-related fitness assessed. Apply a unified approach for all students based on the test’s compatibility with Fitnessgram. Create appropriate IEPs for students with disabilities. 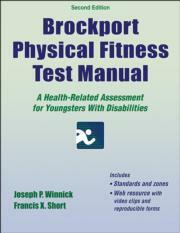 Brockport Physical Fitness Test Manual: A Health-Related Assessment for Youngsters With Disabilities has been adopted by the Presidential Youth Fitness Program as its assessment program for students with disabilities. Its web resource includes reproducible forms and tables that help teachers administer the tests including fillable test data forms for each of the five disability classifications. The web resource also includes Excel worksheets that allow you to enter test scores and quickly calculate whether scores are in the Adapted Fitness Zone or Healthy Fitness Zone for each test item and classification. Finally, the web resource includes video clips that demonstrate assessment protocol for the tests. This text provides teachers with all the information and tools they need for assessing students with disabilities, evaluating their readiness for inclusion in nonadapted PE classes, and generating and assessing IEPs for students. Joseph P. Winnick, EdD, is a distinguished service professor of physical education and sport at the College at Brockport, State University of New York. He received master’s and doctoral degrees from Temple University. Dr. Winnick developed and implemented America’s first master's degree professional preparation program in adapted physical education at Brockport in 1968 and since that time has secured funds from the U.S. Department of Education to support the program. He continues to be involved in research related to the physical fitness of persons with disabilities. Dr. Winnick has received the G. Lawrence Rarick Research Award and the Hollis Fait Scholarly Contribution Award and is a three-time recipient of the Amazing Person Award from the New York Association for SHAPE America ─ formerly known as the American Alliance for Health, Physical Education, Recreation and Dance (AAHPERD). He has also received a Career Achievement Award from the College at Brockport and is a fellow in the Research Consortium of AAHPERD. Francis X. Short, PED, is professor and dean of the School of Health and Human Performance at the College at Brockport, State University of New York. Dr. Short has been involved with adapted physical education programs for over 40 years. He has coauthored numerous journal articles related to physical fitness and youngsters with disabilities. He also has authored and coauthored books and chapters related to adapted physical education. Dr. Short has served as project coordinator for three federally funded research projects pertaining to physical fitness and youngsters with disabilities and is a recipient of the G. Lawrence Rarick Research Award. He is a member of SHAPE America — formerly known as the American Alliance for Health, Physical Education, Recreation and Dance (AAHPERD)—and the National Consortium for Physical Education and Recreation for Individuals with Disabilities. All ancillary materials are free to course adopters and available at www.HumanKinetics.com/BrockportPhysicalFitnessTestManual. Includes reproducible charts and forms as well as video clips that demonstrate assessment protocol for most of the tests.